Karina's Kreations: 3D Ornament Card! We made this cute card at my Super Fun Stamp night. I wanted a card that was cute but not too hard to make. The card stock colors are Whisper White, Marina Mist, & Cherry Cobbler. The Designer Paper is Frostwood Lodge in the Holiday Mini Catalog. I used Hand Penned Holidays for my stamp set. I love this set!!! To create the ornament, punch three ornament shapes out of Frostwood Lodge Designer Series Paper using the Ornament punch. Fold each ornament in half and attach the three sides together. 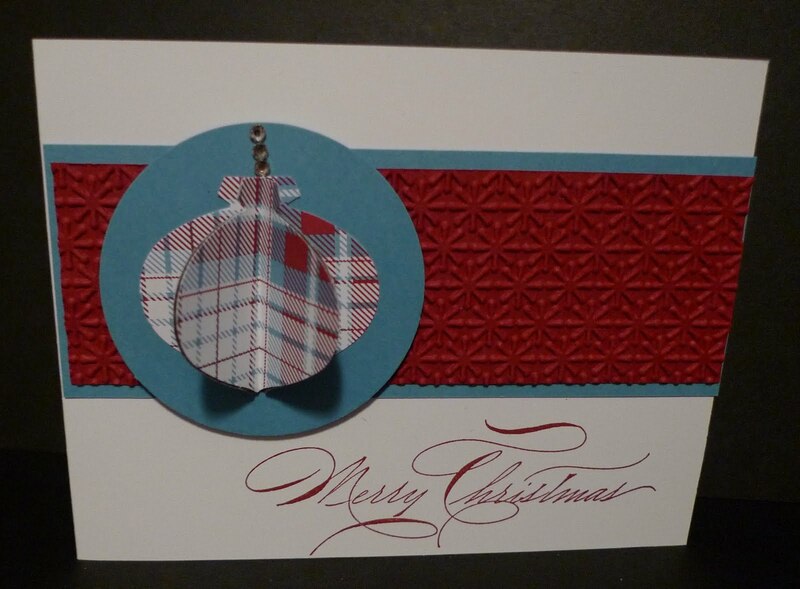 Attach the ornament to a 2-1/2" Circle. I added some jewels to give my card some sparkle. The Cherry Cobbler card stock was embossed with the Snow Burst Textured Impressions Embossing Folder.